Once upon a time I was a student at the University of Michigan in Ann Arbor. Sure, Ann Arbor may be famous for having the school, but it is almost as famous for having a little deli called Zingerman’s. Well, back in 2003 they opened a non-deli restaurant called Zingerman’s Roadhouse far off campus and I paid them a visit. At the time, all I needed to be happy was a $1 slice of pizza (okay very little has changed) and I wasn’t much for the fancy stuff. 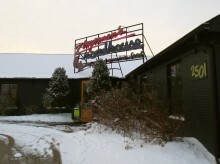 So, at the time Zingerman’s Roadhouse did very little for me and simply didn’t feel special. 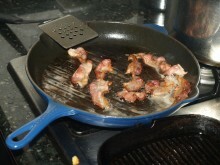 Guest blog courtesy of Joel Danto and Bacon. If your mouth isn’t watering, you may be dead. December 4th was a very momentous day. You may be wondering, just as my people do during Passover, “Why is this night different from all other nights?” Well, friendos, prepare to be shocked and possibly appalled, as I have done something completely reprehensible. I…ate…bacon. And I didn’t just eat bacon, I threw a BACON BASH — complete with a six course menu. Yes, if it existed, I would probably be going to Jewish Hell, which likely consists of strapping me to a chair and making me watch Joan Rivers television shows on repeat with a bagel, cream cheese and lox slightly out of reach. Hopefully this is a Hell that few will ever have to experience. Well this is just perfect. 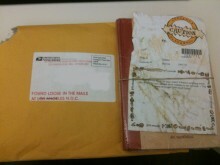 A few weeks ago, I ordered the Guide to Better Bacon from the Zingerman’s food empire as a gift for one of my friends. A real friend forces you to eat tons of bacon! Anyway, the book never showed, so I called up Zingerman’s and they were kind enough to ship me another book expressly. The new book arrived two days later and soon after made its way to my buddy. A few days passed and I forgot about the book, but when I got my mail this morning, I was greeted by a most pleasant surprise. Looks just like a corner store. Perched on the corner of Detroit St. and 5th St. in the little town of Ann Arbor is the seat of an international empire. It is the Zingerman’s Delicatessen and the little nondescript building that houses it has spawned an entity known by lovers of good food and business everywhere. 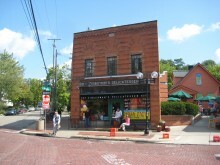 When I went to college at the University of Michigan in Ann Arbor, I knew of Zingerman’s, just like everyone did. I knew it was good, too, but I really never comprehended the magnitude of it until I left Michigan. Since then I have learned that they are nationally renowned for their mail-order service, business practices, overall quality of their food and more. So when I returned to Ann Arbor recently, I knew I had to revisit the wondrous little deli and reacquaint myself with its delectable foods.